Perhaps Europe’s most iconic destination, France has great food, wine, art, architecture, history and more! From the exploring the halls of the Louvre and Versailles, to the vineyards of Burgundy, to the beaches of Normandy and Nice, a captivating holiday in France can be tailored to suit your time and taste. 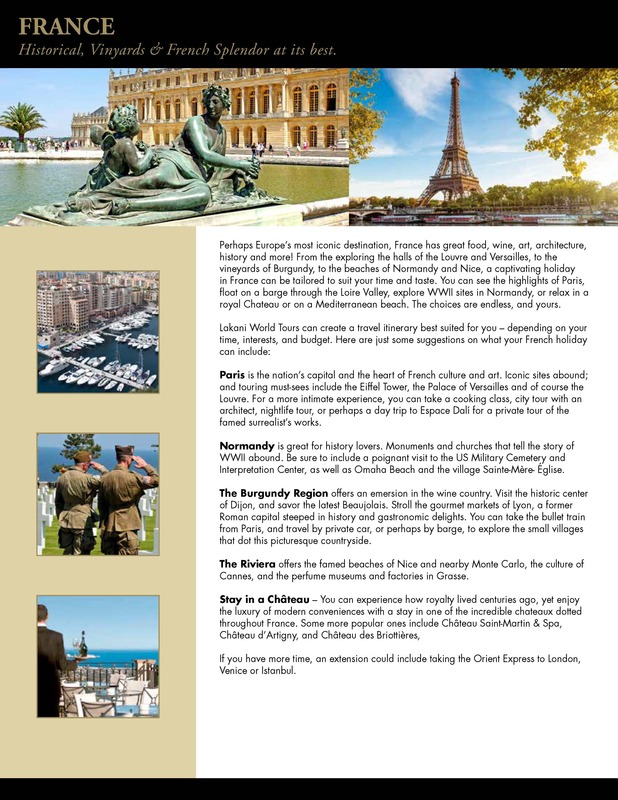 You can see the highlights of Paris, float on a barge through the Loire Valley, explore WWII sites in Normandy, or relax in a royal Chateau or on a Mediterranean beach. The choices are endless, and yours. See the iconic sites of Paris. The nation’s capital and the heart of French culture and art. Iconic sites abound; and touring must-sees include the Eiffel Tower, the Palace of Versailles and of course the Louvre. For a more intimate experience, you can take a cooking class, city tour with an architect, nightlife tour, or perhaps a day trip to Espace Dalí for a private tour of the famed surrealist’s works. Normandy is great for history lovers. Monuments and churches that tell the story of WWII abound. Be sure to include a poignant visit to the US Military Cemetery and Interpretation Center, as well as Omaha Beach and the village Sainte-Mère-Église. The Burgundy Region offers an immersion in the wine country. Visit the historic center of Dijon, and savor the latest Beaujolais. Stroll the gourmet markets of Lyon, a former Roman capital steeped in history and gastronomic delights. You can take the bullet train from Paris, and travel by private car, or perhaps by barge, to explore the small villages that dot this picturesque countryside. The Riviera offers the famed beaches of Nice and nearby Monte Carlo, the culture of Cannes, and the perfume museums and factories in Grasse. Stay in a Château – You can experience how royalty lived centuries ago, yet enjoy the luxury of modern conveniences with a stay in one of the incredible chateaux dotted throughout France. Some more popular ones include Château Saint-Martin & Spa, Château d’Artigny, and Château des Briottières. If you have more time, an extension could include taking the Orient Express to London, Venice or Istanbul.